Am i eligible to apply for IES exam while in final year of instrumentation engineering? i m final year of instrumentation engineering can i apply for ies exam? am i eligible for that . where should i apply and what is the procedure. Can Instrumentation Engineering student apply for IES examination? Am i eligible for IES exam after pursuing 4th year B.Tech Instrumentation engineering? What is the syllabus for IES? Can engineers from Instrumentation and Contol Engineering apply from any discipline in IES Indian Engineering Servces? Am I eligible to appear IES examination with B.E. in Electronics and Instrumentation? Can the candidates of Instrumentation Engineering apply for IES Exam? Can i apply for IES exam, I am doing electronics and instrumentation engineering? Am I eligible for IES Exam being a candidate of pursuing final year of B.Tech in CSE? What kind of work a IES Officer should do? Am I eligible to apply for IES Exam being a candidate pursuing final year of BE course? Can a B.Tech ECE student apply for IES exam? Should I apply online or offline for the exam? Can Electronics and Instrumentation Engineering candidates apply for IES Exam? Am I eligible for IES Exam having completed B.Tech in Electronics and Instrumentation Engineering? Can a person pursuing B.Tech in instrumentation and control engineering branch apply for IES? Am i eligible to appear in IES exam in final year of B.E Mechanical? Re: Am i eligible to apply for IES exam while in final year of instrumentation engineering? Yes, you can apply for ESE exam, during final year of engineering. The exam is conducted by UPSC under the streams of civil, mechanical, electrical, or electronics. Your age must be between 21 and 30 years. Backward category candidates can expect relaxation in upper age limit. Applications can be submitted online via the web site of UPSC. If you have completed B-Tech / BE OR M.Sc. degree or equivalent with Wireless Communication, Electronics, Radio Physics or Radio Engineering as a special subject is also applicable for IES exam. You are in final year of instrumentation engineering branch so you are applicable for IES exam. The applicant age should between 21 yrs to 30 yrs.Age relaxation is provide for SC/ST/OBC candidate as per govt rule . Number of attempts for IES exam is for general student it is 4., for OBC it is 7 times. and for SC/ST it is 9 time. 44-A / 1, Kalu Sarai (Sarvapriya Vihar) New Delhi – 110016. Yes you can eligible to apply for the IES exam while in final year of Instrumentation Engineering. You should complete the Graduation in Engineering from recognized University. 21 years to 35 years. YES, you are eligible to write the UPSC conducted Engineering Services Exams. Yes you are eligible for IES exam. IES stands for INDIAN ENGINEERING SERVICE this exam is conducted by the UPSC once a year. A graduation from a recognized university of india. There in no need of marks in graduation level. Upper age relaxation for SC/ST,OBC candidates. ♦> There is no any Restriction on the Percentages all is just a candidate have to passed out their Graduation degree that's it....!!! ♦> A candidate must be an Indian. Minimum age should be 21 years. Maximum age should not exist 30 years. A candidate can apply maximum 4 attempt. Yes, you are eligible to apply for IES while in the final year of Instrumentation Engineering. IES- Indian Engineering Service conducted by UPSC once every year for appointment of young Engineers in the Top Technical Post under Central Government Various Department. The eligible candidate must be an Indian National having either appear for the final B.Tech. Degree exam or pass in any stream from a recognised University within the age of 21 to 30 years with upper age relaxation for reserved candidate. As IES Exam for 2013 has been taken in the month of June 2013 so by the next year 2014 you can apply for Indian Engineering Services conducted by the UPSC. You should have a 4 years Bachelor degree in Engineering from recognized university. Your Bachelor Engineering degree should be of Mechanical/Electrical/Electronics and Communication/Civil Engineering. As you have Instrumentation Engineering which comes under ECE Branch of Engineering this you can apply for IES Exam. Your age should not be above 30 years. This will include three papers. Each paper will be of 2 hours. Paper I (General Ability Test) - Part A General English and Part B General Studies. Paper II and III - Engineering paper from your subject stream that is from Instrumentation Engineering. It will include two papers from your subject background. Each paper will be of 3 hours. Date of Notification starts from - 08/02/2014. Last Date to Apply - 10/03/2013(Monday). Date of Examination Starts from - 24/05/2014 and this exam will be continue for three days. As per the given above information you will have to visit UPSC Exam Notification Website.To visit Click-Here . Under this site you will have to check "Notification" for "Current" Session. You will have to select "IES Exam". If you will able to meet the above eligibility conditions then you can apply from the given above dates through this given link -->> Click-here / through UPSC Online Official website. Fill your details and make the payment for exam and after that you can appear for UPSC IES 2014 Exam. IES Stands for Indian Engineering Service examination and this examination is conducted by Union Public Service Commission Once in a year. If you have completed Engineering course then also you are applicable for IES exam OR If you have M.Sc degree in Physics , Radio Physics then you are applicable for IES exam. Paper I (Objective Paper) - Total Marks 600. General ability test and General studies - Total Duration 2 hours. Engineering Paper I - Total Duration 2 hours. Engineering Paper II - Total Duration 2 hours. Paper II (Conventional Paper) - Total Marks 600. Engineering Paper I - Total duration will be 3 hours. 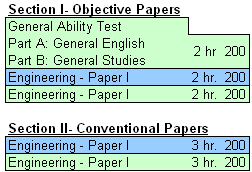 Engineering Paper II - Total duration will be 3 hours. 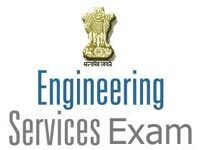 IES : Indian Engineering Service examination . IES exam conducted by UPSC once in a year. Your Age between 21 to 30 yrs. which is conducted in three days. Part II is of conventional papers. Indian Engineering Service(IES) Examination is conducted by UPSC(Union Public Service Commission). Which a candidates you completed engineering graduation there are eligible to apply this IES exam. IES examination is conducted by UPSC every year in the month of May. B.Tech(electrical,electronics&Communications,Civil and Mechanical engineering) from a recognized University. Final year students of B.Tech can also apply for IES exam. -For OBC Category age relaxation is 3 years. -For SC/ST category age relaxation is 5 years. -For PH Category age relaxation is 10 years. Apart from General Awareness and General English,there will be separate papers of every disciplines.i.e.Civil engineering, mechanical engineering, electrical engineering and electronics & Telecommunication engineering.Engineering Questions for each discipline will be asked from IIIyr of B.E/B.Tech level. > Age of applicant has to be between 21-30 years..
> If you are an OBC candidate then you can appear till the age of 33 years and if you belong to SC or ST category then you will be able to appear till 35 years of age.. Final year candidates are eligible to appear for IES but unfortunately Instrumentation Engineering candidates are not applicable for IES Exam.. Although you can appear for GATE Examination or if you want..you can appear under any of the above mentioned streams for IES but that is going to be very difficult for you as you have to prepare for a totally different subject than yours.. If you are in final year of Engineering Graduation and you are expecting your final year result on time then definitely you can apply for Engineering Services Examination. Engineering Graduate from any stream can apply for this exam means you don't worry if you have done Engineering in Instrumentation Engineering. So you have to prepare for this exam according to the above discipline. The exam is conducted by UPSC and you have to fulfill some criteria before applying for this exam. Age must be between 21 to 30 years for those who belong to General category. Age relaxation is available for those who belong to reserved category. Indian Engineering Service exam conducted by Union Public Service Commission once in a year. IES stands for the Indian Engineering Services .The entrance examination for this service is conducted by the Union Public Service Commission every year. In my opinion it is best entrance exam for the b.tech graduates for getting job in government departments. >>You must have bachelor's degree in engineering /technology in any discipline from a recognized university .Final year candidates can also apply for the exam. So you are eligible for the IES exam during your final year of Instrumentation engineering. >>The general age limit for the IES entrance exam is 21-30 years.Relaxation of three years to obc and five years to sc/st respectively. For general candidates the number of attempts is 4 while for obc is seven and that for sc/st candidates is unlimited that is they can attempt all the exams that fall within their age limit. 4.Nationality: You must be an Indian citizen. Note: MADE EASY is the best institute for preparation of IES entrance exam. >>If you are interested in applying online then you can go for it at www.upsconline.nic.in. >>There is simple procedure for applying online which is provided at the site.The important dates for the IES 2013 are already over .now you will have to wait for the notification of IES 2014.Till then keep preparing for the exam . Hope the information helps you.If you have any other query regarding this you can leave your message here .